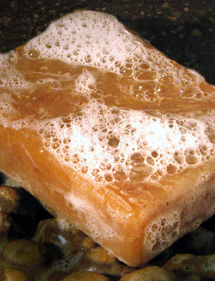 If you’re searching for classic bay rum scent in a soap, we’ve got the best. We’re crazy about it! We offer this body bar with or without exfoliating oatmeal and also in a round, creamy shave puck. Vibrant with the irresistible spiciness of the West Indian bay tree, this soap will quickly become your favorite. Prized essential oil of Pimenta racemosa, a cousin of allspice, dominates the fragrance. Then we top off the aroma with just a dash of sweet orange oil. The natural russet color of the bar comes from steeped elderberries. The emollient in the soap, jojoba oil, softens your skin. It adds extra moisturizer to rich, velvety lather. It’s a long lasting bar, like all of our soaps. Guys use this creamy lathering bar to shave and shampoo. Available with or without oatmeal. Love Bay Rum? Try our Aftershaves! Love Bay Rum? 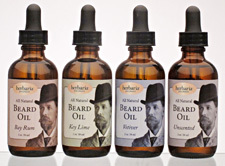 Try our Beard Oil!